Pictured here are some students In Mrs. Vance's classroom who coded Cubetto, dressed up as a postman, to deliver our Santa letters to the North Pole. The students were so excited that they were going to meet a robot. Congratulations to our 2018 Teacher of the year Mrs. Monica Sottoriva! 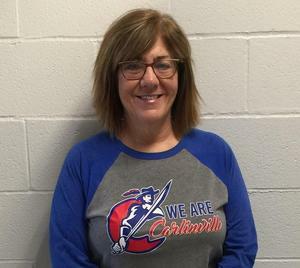 Mrs. Sottoriva has taught 8th grade English at CMS since 1994, when her husband retired from active-duty (Army) and they moved to Carlinville, her hometown. She considers it a blessing to be able to teach in the district where her father once taught in a one-room country school, her mother was school nurse, she attended kindergarten through high school, and where her two sons were fortunate to have obtained an excellent education as well. Do you or your child know a teacher who goes beyond the call of duty, goes the extra mile to reach out to his or her students, has a unique and creative way of teaching and has a love for their students? Well, if you do, here is your chance to let everyone know. Print and fill out the form!! High School Musical "Freaky Friday"
Post Prom 2019 is excited to announce the CAVIE Store is now OPEN! If you're looking for CAVIE specific items for a current CAVIE, ALUMNI CAVIE, or Up & Coming CAVIE we have the items for you. · Christmas is just 9 weeks away. · The store closes on Nov 8th.